Hon. Judge Zervos granted the applicant bail as he was held in remand for more than double the time he would ever have been sentenced after trial. Also Judge Zervos has made spectacular speculations as to why people overstay in Hong Kong and raise non-refoulement claims only later on. This is a clear example of a very experienced lawyer and new judge from the DOJ who appears to have little first hand experience acting for a refugee. There seems to be scant consideration about the motivations and fears of asylum seekers after arriving in Hong Kong, where they know the acceptance rate is effectively zero percent. An extraordinary effort by the Vision First pro bono legal team secured a significant success against the immigration machinery that processes, rejects and finally removes 99.9% of refugees who have the misfortune of seeking the protection of the Hong Kong Government. 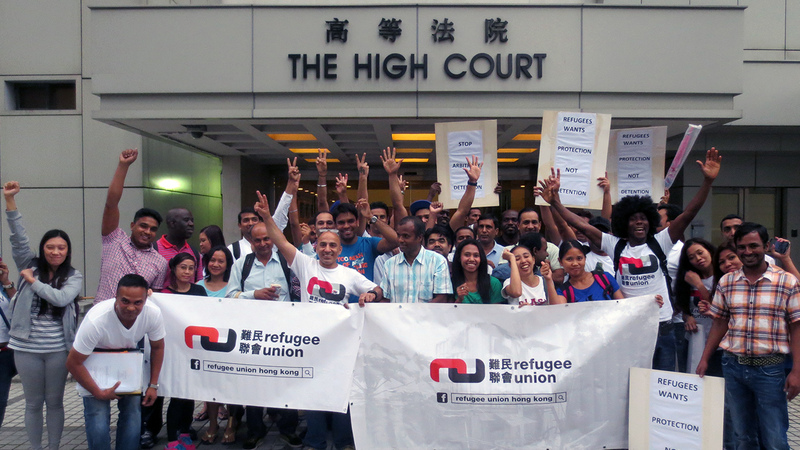 The operation to secure the liberty of Mr. A (who cannot be named for legal reasons), a South Asian refugee who arrived in Hong Kong in 2014, commenced on 6 May 2015 when Barrister Mark Sutherland and solicitor Tam Kam Tong met him at a legal visit at the Castle Peak Bay Immigration Centre (CIC). On the same day, a request was made to the Immigration Removal Assessment Section (RAS) for his immediate release on the grounds that his detention was arbitrary and unlawful. It transpired that Mr. A had been detained throughout the entirety of the process of assessment of his first tier non-refoulement claim a process which took more than four months. 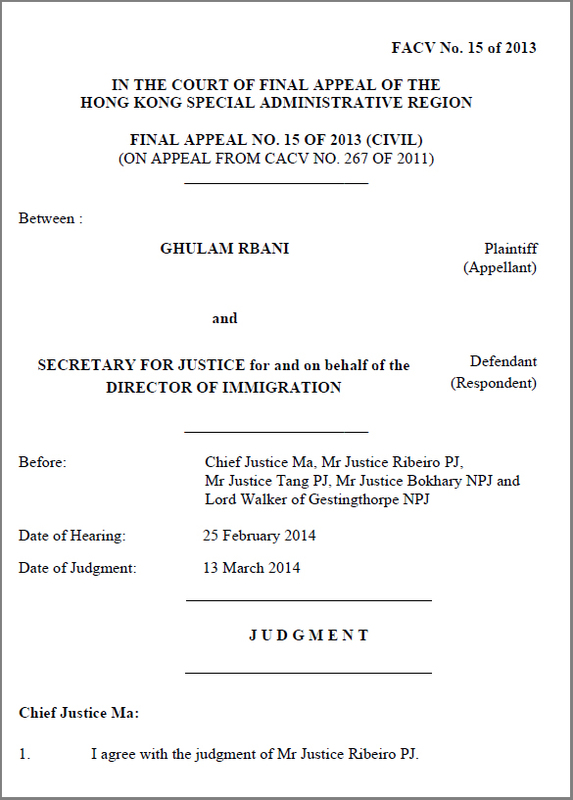 Vision First has previously commented on the Director of Immigration’s apparent disregard for the judgment in Ghulam Rbani v Secretary for Justice for and on behalf of the Director of Immigration  17 HKCFAR 138, which requires the Director to act expeditiously in releasing a refugee once a claim has been filed. Vision First is not persuaded that four months in Mr. A’s case can be said to be an expeditious move towards release on any reading. See our blog: Legal visit exposes apparent abuse in immigration detention centre. The later refusal of Mr. A’s claim was inevitable in view of the Government’s rejection of virtually all first tier claims. The complex process that led to Mr. A’s release tried the skills and determination of his lawyers. The Director of Immigration, Mr. K.K. Chan did not consider the grounds put forward for his release and instead scheduled his removal on a flight out of Hong Kong on 11 June 2015. The morning before, Mr. A. called Arif of the Refugee Union pleading for an urgent intervention. Time was of the essence, because he was scheduled to be taken to the airport the following day. 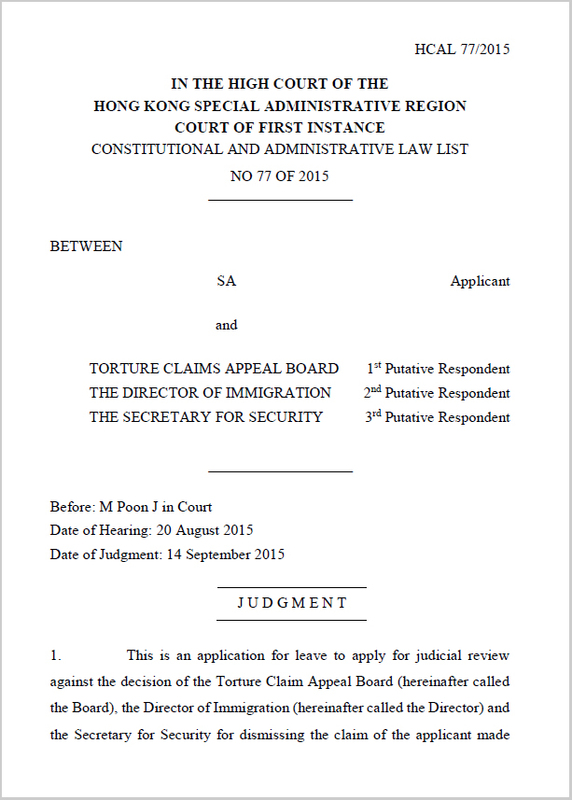 In the morning of 11 June 2015, the legal team comprising Barrister Sutherland and solicitor Tam, acting on a pro bono basis, made an urgent application for a writ of habeas corpus ad subjiciendum, coupled with an application for stay of execution of the removal order. An ex parte hearing on notice was set for that afternoon at which Mr. Sutherland submitted to the Hon. Judge Chow that Mr. A could not be removed because he had not exhausted his legal remedies. These included an application for leave for a judicial review of his asylum claim rejection, as well as a damages claim for unlawful detention, not to mention an appeal against the refusal of legal aid. The application was won by the Director of Immigration, who was represented at the hearing, despite the first-tier Notice of Decision and the Appeal Decision not having been made available in Court. This was against the backdrop of requests made to the Director of Immigration and The Duty Lawyer Service to produce all the documents pertaining to this case, all of which remain unanswered. A message from a Refugee Union member later circulated on social media, “This calls for the Union to have heart. I saw our lawyer and barrister sweating on behalf of the refugee and I felt like collapsing due to the Immigration lawyer was insisting on removal. I saw people who don’t have empathy at all. Anyway we need to push forward.” Her disappointment was certainly shared by her colleagues. After the hearing, the Immigration officers and Department of Justice Counsel Mr. Lawrance Chan were clearly pleased with the result, as evidenced by their smiling faces. After the Court hearing, Solicitor Tam and Arif rushed to the airport to seek urgent instructions, but Mr. A was nowhere to be found. Both Immigration and the Police could not shed any light on his whereabouts. Early the following day Barrister Sutherland recalls, “I personally telephoned CIC to ascertain Mr. A’s whereabouts and to notify Immigration Officer Mr. S.K. Wong that an urgent legal visit had been requested for later that day. To this, Mr. Wong, whilst confirming that Mr. A was at CIC, sounded surprised and replied, ‘You had better be quick because we are taking him to the airport tonight’”. In the afternoon of 12 June 2015, the legal team met a visibly shaken Mr. A in CIC. He was afraid of being deported. It is likely that CIC officers had informed him about the High Court failure, at which he was not present despite the requirement for authorities to “produce the body” in habeas corpus proceedings, which is Latin for “you [shall] have the body”. It became apparent that the next few hours would be crucial as the Director of Immigration, Mr. K.K. Chan decides to either remove or release the refugee. 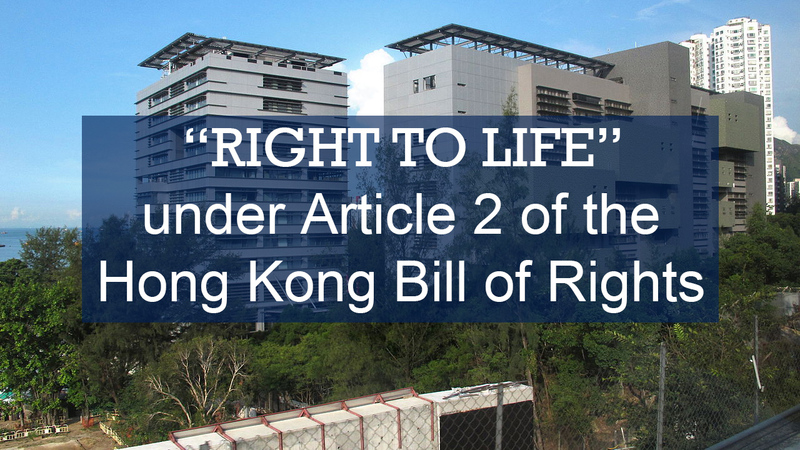 Mr. A’s “Right to Life” claim under Article 2 of the Bill of Rights had since been filed and the Director of Immigration warned not to remove him due to this further legal impediment. Vision First is pleased to report that Mr. A was released from detention on Saturday, 13 June 2015. It is now our tum to smile. 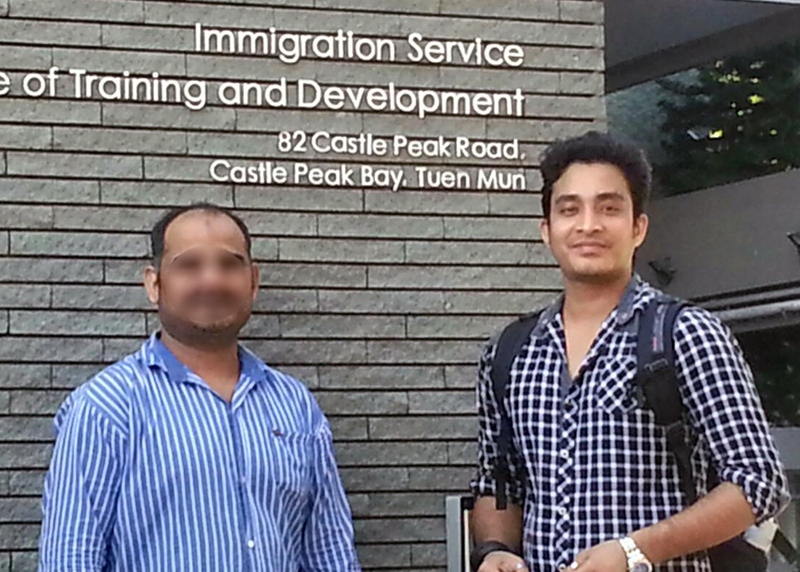 Freedom and justice were almost denied Mr. Q, a South Asian refugee who sought the protection of Hong Kong Government on 23 December 2014, only to be detained and subjected to robust rejection and removal action until his release from Castle Peak Bay Immigration Centre (CIC) on 3 June 2015. What suffering does a persecuted refugee endure in 162 days and nights of Immigration detention? For good reasons unlawful detention is compensated by Hong Kong law with HK$1,000 per day, as the rule of law takes the depravation of anyone’s liberty most seriously. Facts lead us to believe that this might not always be the case behind the secretive walls of Immigration detention. The legal team of Barrister Robert Tibbo and solicitor Chris Lucas finally secured Mr. Q’s release after filing a leave application for Judicial Review at the High Court. Upon the application being filed, the Director of Immigration, K.K. Chan made the decision not to deport the refugee and a few days later exercised his discretion to release him from CIC. The process however was less than smooth. The Director of Immigration had previously attempted to deport Mr. Q from Hong Kong, the last attempt being made on 1 June 2015. 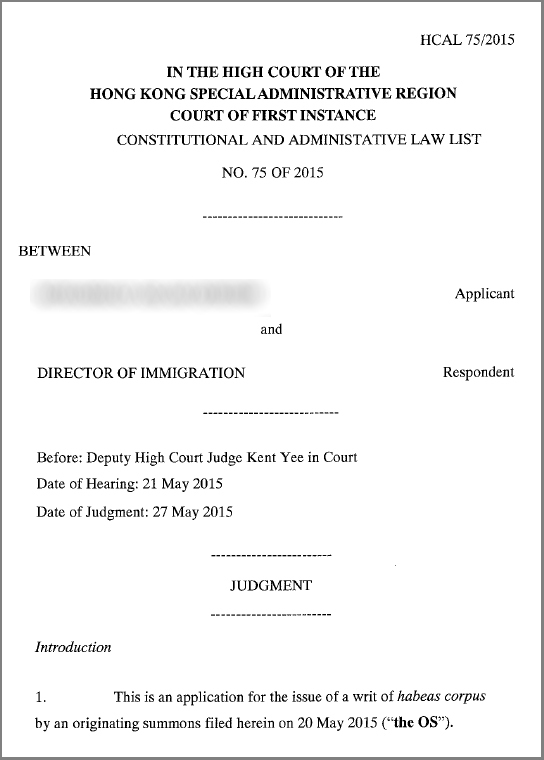 On that day, the legal team acted with great determination and urgency to file the leave application for Judicial Review in the High Court before the 4pm deadline, thus stopping the Director from deporting their client. It should be noted that on 1 June 2015, the Director of Immigration, K.K. Chan was fully aware that the legal team had already applied for Legal Aid, was about to file a Judicial Review and had applied for and successfully obtained an Anonymity Order from a High Court judge. Despite all of the above, the Director took every possible step to attempt to deport the refugee prior to the 4pm deadline. Mr. Q’s account of his treatment by Immigration officers inside CIC and at the airport is disturbing. Vision First has no reason to believe that Mr. Q is lying, although readers may judge for themselves. Lastly, alert readers might wonder how such harrowing treatment by Immigration officers meets the high standard of fairness demanded by Hong Kong law in the processing and determination of asylum claims. On 23 December 2014, Mr. Q arrived in Hong Kong and was refused permission to land and, on the same day, lodged a non-refoulement claim (USM) with the Director of Immigration. On the following day Mr. Q was transferred to Castle Peak Bay Immigration Centre (CIC) where he was held pending the final determination of his asylum claim. He remains incarcerated there to this date. On 3 February 2015, Mr. Q submitted his asylum form with the assistance of a duty lawyer and a screening interview was conducted on 17 February. On 24 February 2015, a review of Mr. Q’s detention was conducted and he was refused release on recognizance on two grounds: 1) his claim would be decided within a reasonable time, and 2) he did not have a fixed abode or close connections (e.g. family or friends) in Hong Kong to make it likely that he will be easily located if released. On 9 March 2015, a Notice of Decision was sent to Mr. Q through DLS whereby he was informed of the rejection of his non-refoulement claim. On 19 March, Mr Q filed his Notice of Appeal of his USM claim with the Torture Claims Appeal Board (TCAB). On 20 and 26 March, reviews of his detention were undertaken and the detention was maintained. On 30 March, Immigration made an application for a removal order. On the same day, the TCAB directed that an oral hearing for Mr. Q’s appeal be held on 30 April 2015. On 6 May 2015, Barrister Robert Tibbo and solicitor Chris Lucas paid Mr. Q a visit in CIC and advised that it would take a considerable time for his appeal to be decided and thus his continued detention was unlawful. Mr. Q was further advised that he might bring a civil action to claim damages for unlawful detention against the Director of Immigration. He complained that his detention breached his human rights under Article 3 and 5 of the Hong Kong Bills of Rights Ordinance. On 8 May 2015, Mr. Q’s legal team claimed that the detention of their client was unlawful. They further demanded immediate release of the applicant lest they should make an application for a writ of habeas corpus. On 12 May, TCAB handed down its decision and dismissed Mr. Q’s USM appeal. A review of his detention was conducted and it was decided that it should continue pending the imminent execution of a removal order. On 15 May, an order for an air ticket was made to remove Mr. Q three days later. On 21 May 2015, Mr. Q lodged a habeas corpus writ at the High Court. On 27 May 2015, the Hon. Judge Kent Yee dismissed the claim that a six-week detention was considered unlawful in Ghulam Rbaniand hence in the present case Mr. Q’s detention since December 2014 must be unlawful. The Judge also dismissed submissions on the alleged underhand approach by the Director of Immigration towards Mr. Q and the use of a removal order to foil his attempt to seek proper legal advice. The Hon. Kent Yee further rejected complaints on the alleged unfairness of the way Mr. Q’s asylum claim was handled which he indicated should be investigated elsewhere. This judgment is not the end of the road for Mr. Q, but the beginning of a complex legal battle aimed at safeguarding his right to asylum and ensure he avails himself of all legal remedies without being detained behind the secretive walls of CIC, or hastily removed from Hong Kong. The court action was mounted to stop Mr Q’s imminent removal and apply for his release from CIC. This week the refugee has applied for Legal Aid and for leave to apply for a judicial review of his USM rejection. 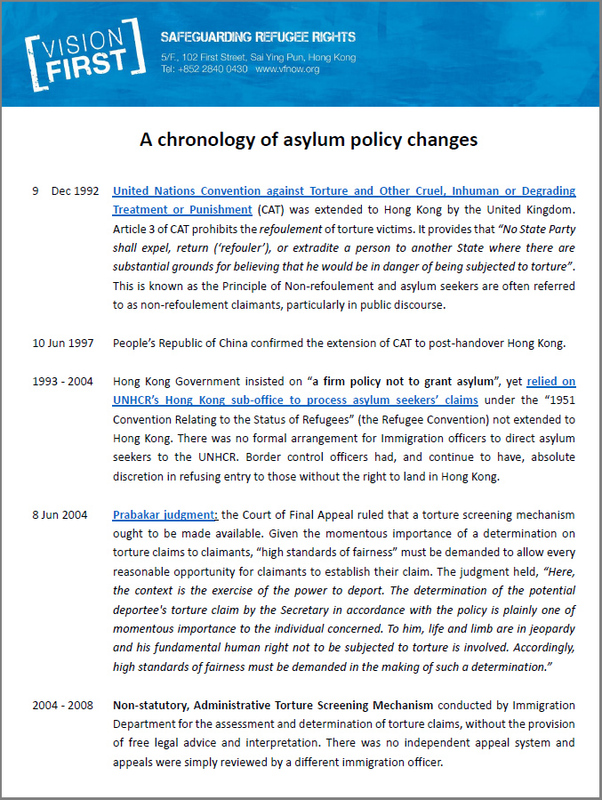 The habeas corpus writ was a first step to hold the Director of Immigration to account in his attempt to remove the refugee after holding him in detention for 5 (five) months and to prevent the refugee from remaining in Hong Kong to exercise his legal rights. 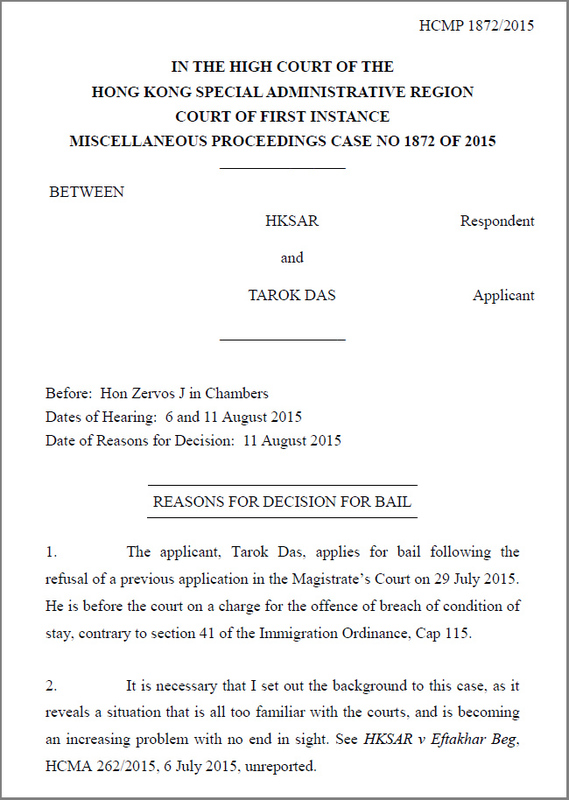 The Court recognising this, granted a stay knowing the refugee will file a judicial review and damages claim. After these documents are filed, the Immigration Department will have no grounds to continue his detention and Mr. Q’s release is widely expected. There wasn’t an empty seat in the courtroom as members of the Refugee Union attended the emergency proceedings to stop the hasty removal of a hapless South Asian refugee by the Director of Immigration. Flanked by two stern-looking Immigration officers in blue uniforms, a bewildered Mr. Q stooped apprehensively in a High Court defendant box. A dark oversize jacket draped the worries of a man who would have been deported three days earlier were it not for the timely intervention of a pro bono legal team. It is likely that Mr. Q was profiled as undesirable by Immigration officers when he arrived at Hong Kong International Airport on 23 December 2014. He was refused permission to land and taken into custody. He subsequently lodged an asylum claim and was detained at CIC under Section 37ZK of the Immigration Ordinance that prescribing, “A claimant may be detained … pending final determination of the claimant’s torture claim.” The issue is: How long can a refugee be lawfully detained? Trouble erupted in Mr. Q’s life after he participated in district elections in his country of origin and was assaulted and threatened that, “All your family will be wiped out if you don’t change political party.” As the 45 year-old family man was unwilling to fight back, the forsaken road of asylum beckoned and he fled to Hong Kong. On 9 March 2015 Immigration rejected his asylum claim at first instance and a troubled Mr. Q sought the assistance of the Refugee Union. Alerted by the Refugee Union, solicitor Chris Lucas and Barrister Robert Tibbo swung into action to counter manoeuvres by the Director of Immigration aimed ostensibly at expediting Mr. Q’s removal. Considerable weight should be given the fact that the lawyers had met the refugee during a pro bono legal visit to CIC on 6 May 2015, but nevertheless Immigration flagrantly ignored such legal representation to fast-track the rejection of Mr. Q’s appeal and his removal in a matter of days. Such rushed arrangements are sufficient to raise suspicion on this case. An attentive audience followed the two-hour Habeas Corpus hearing that was opened by Barrister Tibbo’s statement: “The Director of Immigration fast-tracked the removal of my client. He has ridden rough-shod over the constitutional rights of a refugee who was warehoused in CIC, as if in an Australian off-shore processing centre. My client was detained for five months instead of being released five weeks after lodging a Non-Refoulement Claim as prescribed by law.” It was submitted that pursuant to the Ghulam Rbani Court of Final Appeal Judgement, Immigration failed in due diligence and gave rise to conduct that is now subject to a damage claim. The legal grounds briefly state that the Director of Immigration, K.K. Chan cannot lawfully detain a claimant when it becomes clear that the determination process cannot be concluded within a reasonable time. The Ghulam Rbani judgment sets this at five weeks, not the five months of Mr. Q’s ongoing detention. Mr. Tibbo put to the court that the discretion to release a refugee must be exercised after five weeks, or the subsequent detention period becomes arbitrary and therefore unlawful. 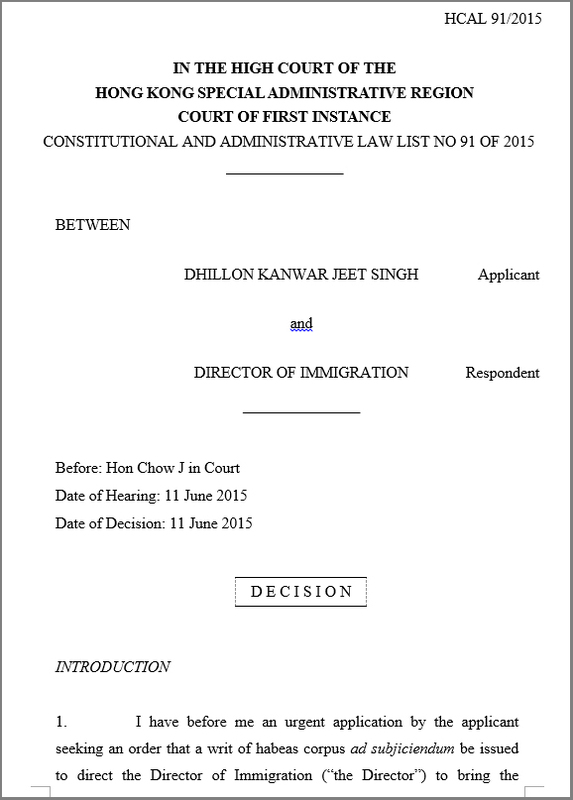 Counsel raised a host of problems, including: looking at the Questionnaire it appears that Mr. Q did not receive proper legal representation inside CIC; he did not have access to resources and country of origin information; he attended an oral hearing without a lawyer; he did not have a lawyer for the appeal; the appeal rejection contained fundamental mistakes; the decision was not interpreted in his language; CIC officers prevented Mr. Q from faxing documents to his lawyers; and, a copy of Immigration’s Notice of Decision had not been provided to the legal team, despite formal request made to the Director of Immigration. 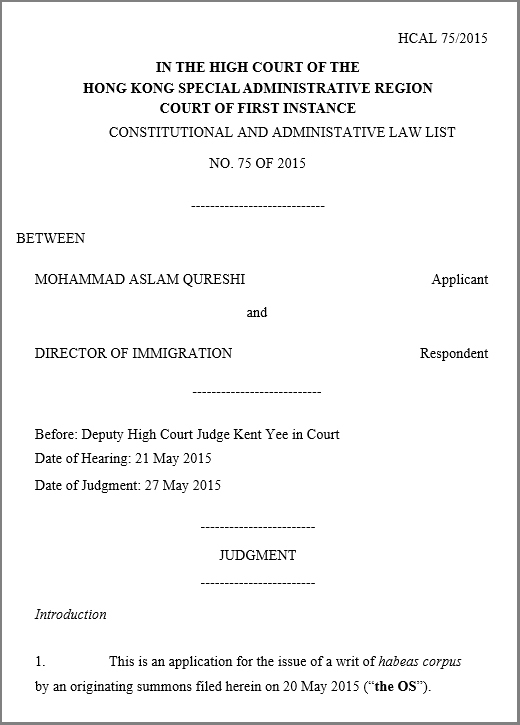 The Honourable Judge Kent Yee presided fairly and extended the stay on the removal order until 29 May, indicating that he intended to give this matter further thought before issuing a written judgement on 26 May 2015. The defence team was encouraged by the extension that granted time to apply for Legal Aid and successfully resist Immigration’s attempts to hastily remove Mr. Q arguably in violation of his right to asylum. Vision First fearlessly reports on incidents that place under the spotlight practices adopted by various Government bodies which include the Director of Immigration, Security Bureau, Social Welfare Department and Hospital Authority. Examples are asylum policies resulting in an effective zero percent acceptance rate, welfare failures, institutional discrimination and abuses of power by those in authority. It is unfortunate that enormous and entrenched distrust continues to widen between refugees and Government authorities, with officials often failing in their duties prescribed by law. Government propaganda and uninformed media reports often depict refugees as abusers of the asylum process accusing them of exploiting the system for personal gain. Such generalisation is simply untrue for asylum seekers who fled torture, ill-treatment, death threats and persecution to seek protection from Hong Kong’s Government. The pro bono legal team comprising Barristers Mark Sutherland and Robert Tibbo, together with their instructing solicitors and interpreters, paid a visit to CIC. This is what transpired. One refugee from Africa had reportedly been detained in CIC for over three and a half months whilst the assessment of his “first tier” non-refoulement claims was underway with all the interviews so far being conducted within CIC. His next interview was due to take place the following day, 7 May 2015. Another refugee from Africa had been reportedly detained for over a month and only that morning had been handed a set of blank Supplementary Claim Forms by The Duty Lawyer Service (DLS). This was presumably prompted by the prior lodgement of a non-refoulement claim. The assessment of this refugee’s claim had not even started and a lawyer not yet assigned to him by DLS. A further refugee from South Asia reported that he had attempted to argue his own Appeal without a lawyer and had experienced a detention period of seven months. Troubled by his findings of lengthy periods of detention, Barrister Mark Sutherland asked to see the supervising Immigration officer. During the course of an hour, three Immigration officers of differing levels of seniority appeared but could not shed any light on the seemingly unlawful detention of the refugees. Put simply, if an asylum seeker has filed a claim for non-refoulement protection, he cannot lawfully be detained and must be released forthwith. Vision First is of the view that the Director of Immigration, Mr. K.K. Chan, should call for an immediate review of the detention status of each and every inmate currently held at CIC. Sutherland invited Superintendent Kwong to see that such a review was undertaken as a matter of priority. The result is awaited. Based on this legal visit, Vision First is satisfied that there is sufficient evidence to merit an independent investigation of the apparent disregard by the Hong Kong Government of the principles enunciated by the Court of Final Appeal in Ghulam Rbani. We shall leave it to our readers to draw their own conclusions.